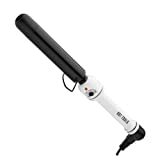 1 1/2 inches thermal hot brush with IONIC generator emits far-infrared heat and negative ION when heated. The dual voltage is great for travel and the IONIC generator produces negative ions to restore hair’s ionic balance for overall health. Also offers a rubberized handle for a more comfortable, secure grip. IONIC tourmaline emits far-infrared heat and negative ION when heated.